When improving my home automation, I wanted to have also colored LED lighting. 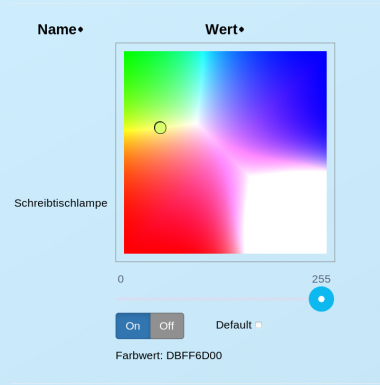 This seems to be easy but in reality I wanted to have an simple control of the color and I want to switch it on and off with a simple (local) switch. The last settings (color and brightness) before switching off should be kept. So that's where a micro controller comes into focus. In the following description I want to introduce you my ideas for your projects. Actually I tried to use a Microchip AVR-IoT with a simple setup, but I encountered several difficulties, so I decided to realize it based on my existing hardware and software setup. For RGWB we need to control 4 lines individually, so one part is the electronic board, but the handling should also be easy and I did not want to fiddle around with 4 individual brightness controls. Each corner is representing one color including the white LEDs. So using a knob I can easily select a color out of this color space. For brightness control I have one additional slider control and switch for turning it On / Off without the need to change the slider settings. This On/Off is same as a physical switch connected to the board. Via a checkbox I can store this value as a new default setting in the flash memory of the micro controller. For information I can see the HEX values for RGWB brightness values. In the following I give you a brief overview about the main topics. For my home control web page I am using PHP on the PI and AngularJS for the controls. The main issue was finding a function to map the 2D position to a 4D color map. The following code snippet shall explain the control shown above and the might help to implement a similar solution. Some sub functions are not included but I think it is self explanatory. The PI is setup with Raspberian, Apache Web Server and PHP 7. Then I can use the serial device via normal read/write from the Web site (PHP) or from any other code. 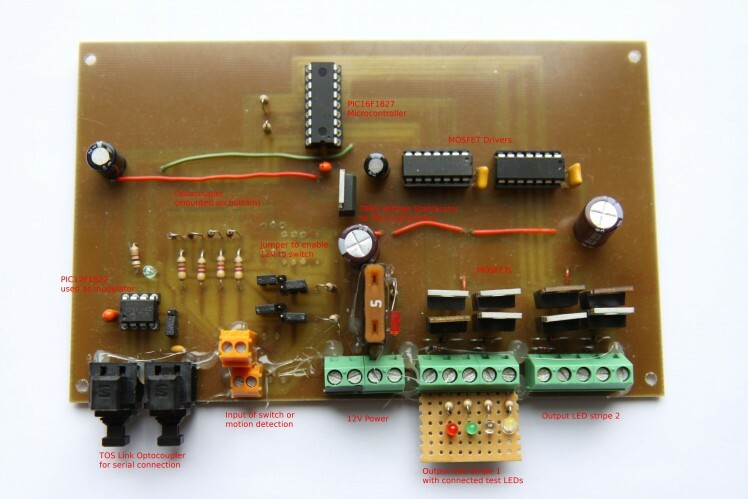 The micro controller uses plain text serial communication (9600 baud to have max. compatibility). It can read, execute and answer simple commands. For nerds like me, who want to try, I have attached the PCB top view and the hex file for programming the PIC16F1827. It is not case sensitive (lower case will be converted to upper case). A valid command will always be answered. I hope this short summary gives you some ideas how to handle home automation DIY. Of course several improvements are possible, e.g. I have to update my control for touch screens. My job is to sell automation systems for steelmaking plants. My private hobby is to equip my home with self built home automation.